Editor’s choice: French toast, smoked ham dock benedict, matcha soy-milked latte. Editor’s choice: The high Society Eggs Benedict, The full English Breakfast, Fruit & Nut, Apple Gimlet. Editor’s choice：Black rice with coconut milk, Shakshka, Kale cucumber lime juice. Editor’s choice： Green Goddess smoothie, brown rice porridge with mango and coconut, ricotta hotcakes, fresh aussie, iced lemon myrtle tea, chilli fried egg bacon roll. Editor’s choice：Lobster royale, baked avocado with runny egg, iced lemon mousse, libretto, the mind juice. Editor’s choice：Sweetcorn fritters, brew melt, organic jumbo oat porridge, Asian broth. Editor’s choice: Santo Monica burger, tacos, crab cakes, strawberry pancake. Editor’s choice: Filled croissant, sunshine brunch, eggs royal. 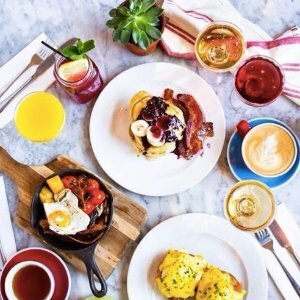 Editor’s choice: Smashed avocado on toast, red velvet and raspberry cupcake, latte .